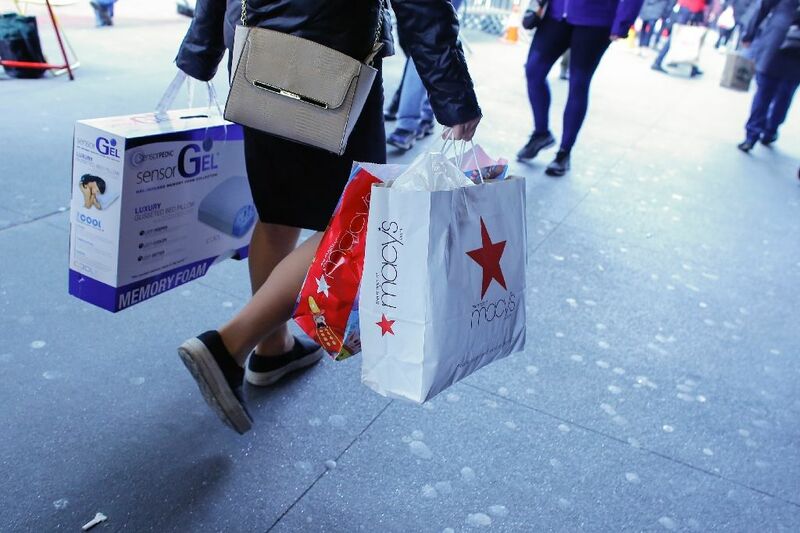 U.S. retail sales rose in December amid strong demand for automobiles and furniture, providing further evidence that the economy ended the fourth quarter with momentum and is poised for stronger growth this year. The strengthening economy also is starting to generate higher inflation. Other data on Friday showed a second straight monthly increase in producer prices in December, which led to the biggest year-on-year gain in just over two years. The Commerce Department said retail sales increased 0.6 percent last month. November's retail sales were revised up to show a 0.2 percent rise instead of the previously reported 0.1 percent gain. Sales were up 4.1 percent from December 2015. They rose 3.3 percent for all of 2016, up from 2.3 percent in 2015. Excluding automobiles, gasoline, building materials and food services, retail sales rose 0.2 percent after being flat in November. These so-called core retail sales correspond most closely with the consumer spending component of gross domestic product. Economists polled by Reuters had forecast overall retail sales increasing 0.7 percent and core sales gaining 0.4 percent last month. The report added to surveys on manufacturing and the services sector in suggesting the economy regained speed at the end of the fourth quarter after appearing to lose some ground in November. Prices of U.S. Treasuries fell while the dollar strengthened against the euro, yen and Swiss franc after the data. U.S. stock futures were trading slightly higher. Rising wages due to a tightening labor market are expected to support consumer spending this year, providing a boost to the economy. Growth is also expected to get a lift from President-elect Donald Trump's pledge to cut taxes, increase infrastructure spending and relax regulations. Average hourly earnings increased 2.9 percent in the 12 months through December, the largest gain since June 2009, the government reported last week. Against the backdrop of a labor market that is at or near full employment, Trump's proposed fiscal stimulus could fan inflation and prompt the Federal Reserve to raise interest rates faster than is currently envisaged. The Fed raised its benchmark overnight interest rate last month by 25 basis points to a range of 0.50 percent to 0.75 percent. The U.S. central bank has forecast three rate hikes for this year. The Atlanta Fed is forecasting GDP rising at a 2.9 percent annualized rate in the fourth quarter. The economy grew at a 3.5 percent pace in the third quarter. Even before the anticipated stimulus, inflation is perking up. In a separate report on Friday, the Labor Department said its producer price index for final demand increased 0.3 percent last month after advancing 0.4 percent in November. That lifted the year-on-year increase in the PPI to 1.6 percent, the largest gain since September 2014. The PPI rose 1.3 percent in the 12 months through November. Producer prices increased 1.6 percent in 2016 after falling 1.1 percent in 2015. Producer prices are rising as some of the drag from the plunge in oil prices fades. Oil prices have risen above $50 per barrel. But renewed dollar strength in the wake of Trump's election could temper some of oil's impact on inflation. A 2.4 percent jump in auto sales accounted for much of the rise in retail sales last month. There was also a boost from a 2.0 percent rise in sales at service stations, reflecting higher gasoline prices. Sales at building material stores increased 0.5 percent as did those at furniture shops. Receipts at clothing stores were unchanged despite a generally busy holiday season. Department store giants Macy's and Kohl's Corp last week reported drops in holiday sales. Department stores have faced stiff competition from online rivals including Amazon.com. Sales at online retailers jumped 1.3 percent last month after gaining 0.3 percent in November. Sales at sporting goods and hobby stores rose 0.2 percent. But Americans cut back on eating out, with receipts at restaurants and bars falling 0.8 percent last month. US retail sales rebounded in the final month of 2016, but driven almost entirely by autos, while wholesale inflation slowed slightly in the world's largest economy, the government reported Friday. Consumers spent the most since April for light trucks and cars, the Commerce Department report showed, but spending on anything besides autos was nearly flat. The figures also pointed to a continuation of consumer trends in shopping, with online businesses seeing rising sales, while department stores moved fewer goods off the shelves. On a seasonally adjusted basis, sales in retail and food services rose 0.6 percent in December to $469.1 billion, far faster than the 0.2 percent rise in November, but slightly below an analyst consensus forecast. December sales were 4.1 percent higher than the same month in 2015, and sales for the whole year, were up 3.3 percent over 2015. Motor vehicles and parts dealers saw the strongest monthly gains, with sales jumping 2.4 percent, the fastest monthly gain in eight months. But excluding autos, retail sales grew at a far more tepid pace of 0.2 percent. Non-store retailers -- such as online marketplaces and mail-order vendors -- saw gains of 1.3 percent but department stores went in the opposite direction, falling 0.6 percent in December. Restaurants and bars also had a slump with business falling 0.8 percent, the biggest drop since January 2016. In a separate report, the National Retail Federation said holiday retail sales in November and December rose four percent over the same period in 2015 to $658.3 billion, with "non-store" sales rising nearly 13 percent. NRF President Matthew Shay said the numbers showed the current economic recovery was gaining pace and that "consumers feel good about the future." An index of consumer sentiment published Friday by the University of Michigan fell slightly for January to a preliminary estimate of 98.1 after surging in December. Ian Shepherdson of Pantheon Macroeconomics said the retail sales numbers from the end of the year could be subject to large revisions but questioned recent strong consumer confidence numbers. "This might be nothing more than a question of lags but we wonder if the consumer confidence surveys do a relatively poor job of capturing the response to the election of young people, especially minorities, who voted heavily for Clinton," he wrote in a research note. "It's hard to explain why headline confidence has jumped so much given that (President-elect Donald) Trump lost the popular vote by" three million ballots. Meanwhile, the Producer Price Index, which measures prices from the seller's perspective, rose 0.3 percent in December, after a 0.4 percent rise in November, the Labor Department reported. Excluding the more volatile categories of food and fuel, prices were up only 0.2 percent. PPI for 2016 rose 1.6 percent over the prior year, the largest 12-month increase recorded since September 2014. - US consumption a touch slower than expected, reflecting a weak holiday for retailers. - Auto sales increased by +2.4% m/m; ex-Auto & Gas, retail sales were flat. - US Dollar initially gains, but mixed report overall tempers rally. The US economy closed out the year on a modest note, according to the latest consumption data released by the US Commerce Department today. Advance Retail Sales, perhaps the best proxy for the largest portion of GDP - with consumption accounting for nearly 70% of the headline - proved strong in December, although not as strong as the market was expecting. The headline figure came in at +0.6% m/m, a shade below the +0.7% m/m forecast according to Bloomberg News. The primary factor in the gains were auto sales, which were up by +2.4% m/m overall; ex-auto & gasoline, retail sales were flat in December. As the last retail sales report of 2016, we now have the benefit of looking back at the year in total. Advance Retail Sales rebounded overall in 2016, up by +3.3% y/y, faster than the +2.3% y/y rate of growth seen in 2015. However, consumption growth remains below the pace seen in 2014, which was +4.2% y/y. It should be noted that a strong finish to the year for retail sales may prove to be the difference between a solid Q4'16 GDP reading and a mediocre one. - USD Advance Retail Sales (DEC): +0.6% versus +0.7% expected, from +0.2% (m/m). - USD Retail Sales Less Autos (DEC): +0.2% versus +0.5% expected, from +0.3% (m/m). - USD Retai l Sales Ex Auto and Gas (DEC): 0.0% versus +0.4% expected, from +0.3% (m/m). - USD Retail Sales Control Group (DEC) : +0.2% versus +0.4% expected, from +0.1% (m/m). Immediately following the data, the US Dollar traded higher against most major currencies . EUR/USD traded in a choppy 52-pip range between 1.0620 and 1.0672, moving from 1.0659 ahead of the release to around 1.0651 . USD/JPY experienced a similar reaction, gaining from 114.37 ahead of the release to 114.86 at the time this report was written. 0 Response to "Strong auto demand boosts December retail sales"